The Blissfest continues working to improve the unique, relaxed and comfortable atmosphere of the annual festival while providing an enriching cultural experience for all. Our goal is to create a Blissfest community that is respectful and responsible for each other and the local year-round community that hosts the annual festival. We strive to be a positive addition to the area during Blissfest weekend with minimal impact. 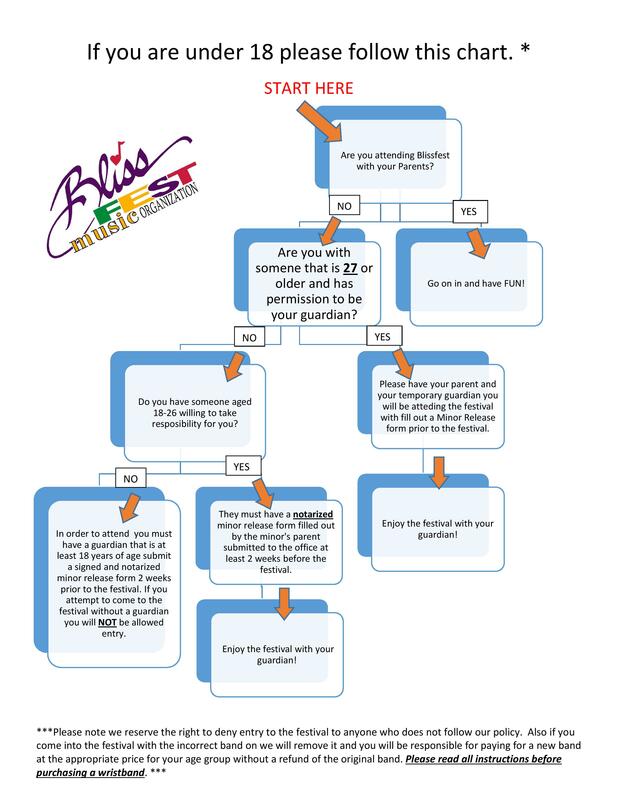 With these goals in mind, the Blissfest Music Organization will implement the following operational policies and revisit these reminders of proper etiquette . . .
Festival wristbands must be worn at all times. Folks without a wristband will have to leave. No Wristband, No Excuses, No Bliss. If your wristband is damaged or tears off bring the damaged band in its entirety (all of it) to the front gate or info/volunteer booth for a replacement. $100 deposit may be required based on situation. You will also need to prove your age. No Trailers/Boats/Tow-behinds in day parking. Anyone under 18 please refer to this chart if attending without your parent. Footwear is the only good way to prevent injury. No bare feet! 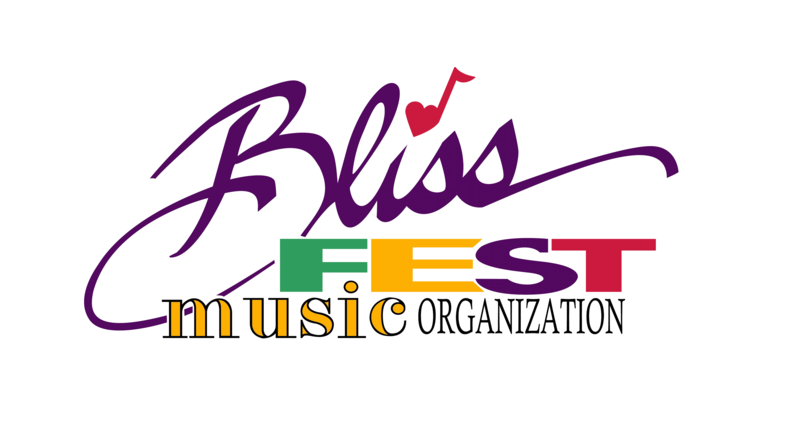 Blissfest Music Festival welcomes and supports the rights and attendance of all persons with disabilities that rely on the special skills of a trained service animal. What we DO NOT support, nor will we allow, are pets being misrepresented by their owners as service animals, when in fact they are not. So please, don’t jeopardize your Blissfest experience. Leave your pet at home as they are definitely not allowed at the Blissfest. Michigan service animal Identification Card is required. Must provide up to date shot/ Vaccine records from a veterinarian for your service animal. Animal must wear approved service animal identification at all times. Animal must be leashed at all times. Owner must keep animal under control at all times. Owner must pick up and properly dispose of their animal’s waste. Please note that all service dogs, including those from out of state are subject to local dog ordinances, which includes a valid rabies certificate. All patrons with disabilities attending Blissfest Music Festival this year with a service animal will need to have that animal credentialed by Blissfest staff when entering the main gate. This process will be performed quickly and respectfully by our Staff. Staff will speak with you, record your contact information, and provide a collar tag for your service animal. Then you are good to go! Be Environmentally Considerate – Do not litter. Do not use soap or shampoo in the lake. Use Blissfest showers for washing. A Blissfest shuttle bus will make trips to the Cross Village Store, Sturgeon Bay Beach and the Bliss General Store throughout the weekend. Drive safely and slowly at all times. BlissAssist – This volunteer crew will help monitor and prevent problems in camping areas. Host Post Campers – A host or hosts will provide information and assistance at each designated camping area. Take a moment to get to know your host post. Teens age 13-17 must be accompanied by an adult 27 or older while attending the festival. See chart on the All About Wristbands Page. Vehicle Camping Pass (Included with your purchase) MUST be displayed prominently hanging from the front mirror of each vehicle at all times while on festival grounds. Nighttime Traffic – Camping areas will be closed to vehicle traffic at dusk. Arriving Late? NO ENTRY AFTER GATE CLOSE! Eleven Series Security Personnel will check ID at the gate and may search vehicles. Michigan State Police and/or Emmet County Sheriff’s Department will be available to issue Minor In Possession and/or other citations at the gate. Security will also patrol the Blissfest grounds. Trespassers will be prosecuted to the fullest extent. Day Parking Areas MUST be cleared by 1 a.m. Vehicles not removed by 1 a.m. MAY BE TOWED at owner’s expense. Main Stage Seating – Only low-back chairs and blanket seating will be permitted in front of the sound booth. A “buffer area” will be designated in front of the stage. A General “Quiet Down” will be in effect from 2 a.m.-7 a.m. in the campground. Respect your fellow festival goers. Parents and guardians MUST have their children and teens under their direct supervision by midnight. Persons engaging in disorderly behavior, underage drinking, public intoxication, illegal drug use, stealing or any other deviant behavior risk removal from Blissfest and possible arrest by appropriate law enforcement agencies. Contained Fires are allowed including camp stoves and grills if they are attended. Restrictions may be imposed if dry conditions warrant. Open fires including but not limited to candles and tiki-torches are not permitted. Please use LED lighting. A “Bliss Attitude” of community respect & personal responsibility will ensure an enjoyable weekend for everyone.